Dance Commentary by Heather Desaulniers: "All Roads Are Lined With Teeth"
I am loving the new ‘dance play’ genre. And I’m purposely calling it new, because I think it is something current, something of today. The dance play is different from Dance Theater and it’s different from the traditional dance dramas brought by the modern dance pioneers. 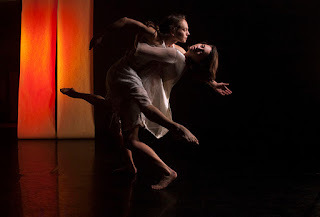 In a dance play, the text and movement have a highly egalitarian relationship. Neither really takes the lead, instead the elements are woven together to unlock and reveal nuanced narrative fibers. The collaborative material is striking and powerful in its own right and yet never seems compartmentalized or unrelated to the larger work. 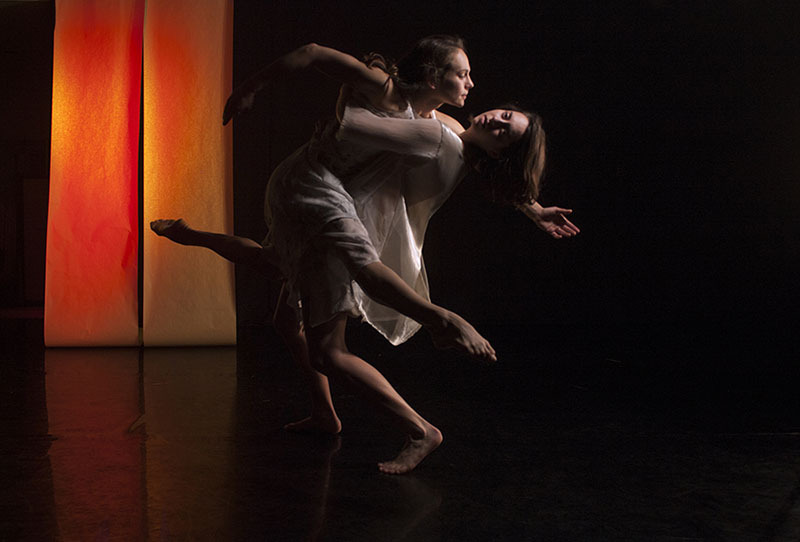 The dance play truly feels like a creature born of the twenty-first century contemporary performance field. Since December, I’ve seen four dance plays, the most recent being last night’s premiere of Sharp & Fine’s All Roads Are Lined With Teeth, choreography and direction by Megan Kurashige and Shannon Kurashige, text by Amber Hsu and score by Aram Shelton. All Roads Are Lined With Teeth tells of the human journey, specifically the journey of one woman. Shared by the cast of five, hers is a non-linear and non-chronological course of searching, discovery and change. One that ranges from complex and chaotic to tumultuous and perilous and even to ordinary and still. As the musical quartet underscored seventy minutes of action, dance scenes fed into text scenes and vice versa, and sometimes both unfolded concurrently in the same vignette. And in communicating the work’s nonlinear narrative, it felt like two main conceptual components were at play (both of which are found in the title) – the road and the teeth. A soloist reluctantly entered the space and knelt downstage left. One by one, the other four dancers joined her, each carrying a bench, which they placed into position and jumped onto. A movement phrase developed on and around the benches, and in the first text soliloquies, we are introduced to the woman. We meet an individual who is in a place of transition, approaching the next leg of her uniquely personal journey. The dancers freeze in a mid-run posture, and the viewer knows that this woman is in the midst of traveling a new road. Teeth served as an ongoing and multi-layered metaphor throughout the piece. Something that appears static but is actually a dynamic and changing entity. A voracious force in unimaginable circumstances. An elusive non-defined structure. A unifying, shared phenomenon. And as the mid-point monologue illustrated, a particular course of development that if interrupted, can lead to a host of complications. It was genius how the project’s collaborators were able to apply the teeth analogy to so many different aspects of the human condition. The middle of All Roads Are Lined With Teeth also had some noteworthy choreographic moments. A structurally diverse duet spoke with long attitudes, quiet gestures and imposed positions. A dark and frenetic ensemble scene found bodies being dragged from one place to another. Dancers convulsed, contracted and extended through the unison phrase that followed. The togetherness of this movement was tricky from time to time, but with the brewing narrative discord in this chapter, it really didn’t matter. Having said that, the middle of the work also had a couple of challenges. For the most part, the dance, text and music kept All Roads Are Lined With Teeth moving in a forward trajectory. But there were some points in the mid-section where the piece slowed and the thread of the woman’s story got a little lost, at least for me. However, the narrative most certainly returned and resurged in the last third as All Roads Are Lined With Teeth reached an unexpected and heartrending conclusion.